In the years between the 1130s and the 1160s, rows of column-figures appeared along the jambs of the doorways of churches in northern France.1 These overlifesize painted limestone statues arranged as if in receiving lines may provide the best possible information about the appearance of courtiers at the time of Louis VII (r. 1131–1180). Rather than being represented wearing clothing copied from antique models, the column-figures appear to wear distinctive costumes of precious silks and finely-woven linens with embroidery or silk tapestry, as if elegantly garbed in contemporary courtly fashions. Just as in the twenty-first century one can distinguish the cowboy in chaps, Levi’s and ten-gallon hat from the golfer wearing plus fours or the ambassador arriving from a fitting on Sav-ile Row, during the twelfth century clothing could signal social position and power. The clothing of shepherds was distinct from that of landlords, and courtly matrons dressed differently from maidens. 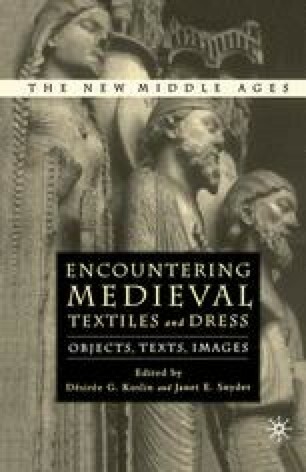 The examination of how and why clothing and textiles are represented in sculpture can be an effective tool in the search for the meaning of medieval portal sculpture.